The SOLFRUNT 1929 low pressure process gauge has 316L SST wetted parts, including a diaghragm capsule for measruring very low inches of water pressure, from vacuum to 30” H2O through 0 to 200” H2O. The PET case is a solid front design for safety protection, with accuarcy of ± 1% of span (Grade 1A). Dials are avialbe in inches of H2O or psi, or metric versions. 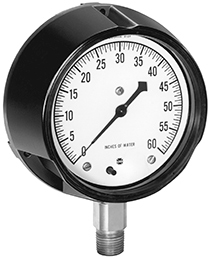 The Model 1929 pressure gauge is available in the low mount ¼” or ½” NPT process connection. The pointer is knife edge to allow for precious readings of the pressure.